Charlene has been using Story Massage for a year now and we recently presented her with the Best Practice Award for her commitment to sharing Story Massage within the school. We asked Charlene some questions about her work. Which classes are you working with? I run a core Nurture Group for children from Primaries 1 to 3 (age 5 to 7 years) and weekly sessions with Upper Nurture Groups for Primaries 4 – 7 (age 7 to 11 years). When I first mentioned Story Massage to the older children they were reluctant to try it but once we started the session, the enjoyment on their faces was priceless! What are the key benefits of Story Massage in Nurture Groups? 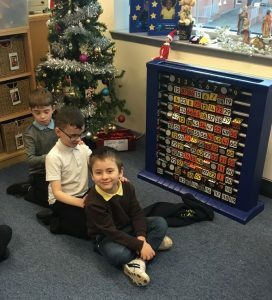 A lot of the children in nurture groups have difficulties getting along with others and Story Massage helps them to see the benefits of being kind and respectful to others. This is invaluable as so many have not enjoyed positive touch or positive relationships in their lives. Pupils are nurturing and caring towards each other in a way they have not been able to express before. 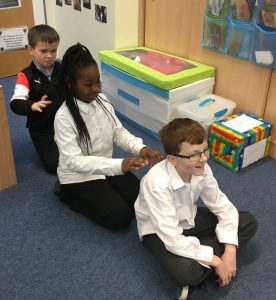 One child in Primary 7 now asks for Story Massage when he feels he is beginning to escalate and needs to calm down. This is a real break through. 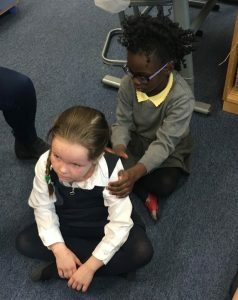 What is also so wonderful is that the children are beginning to recognise that Story Massage can be used to help others when they are feeling sad or need some time to relax. 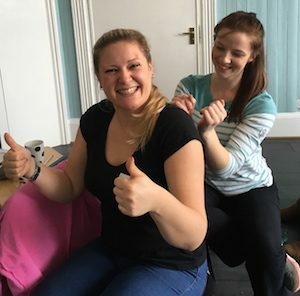 We have found that Story Massage helps children to express their feelings in a safe and enjoyable way which helps foster a positive trusting bond between children and adults in a very real nurturing context. 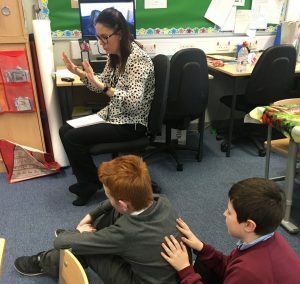 Pupils know they are cared for, can be listened to and they learn how to access a mindfulness approach through Story Massage. Over the past year we have seen how Story Massage can help children to support each other in a very special way. We notice how they work together to become more self-aware and develop self-growth. This is so important in building the resilience necessary to cope with the many childhood adversities the children are facing on a daily basis. The storytelling element of the activity helps encourage children’s imagination and desire to read and write stories. It is flexible so it can be used to suit the age and needs of the children you are working with. We place great emphasis on language development and communication within the group and Story Massage has a key role to play. The children love creating stories for special events in the year. In addition we continue using massage stories from the Story Massage book. How do you structure your sessions? At first we ran weekly Story Massage sessions which helped the children become familiar with the strokes and rules such as saying “Please may I give you a massage?” and “Thank you for letting me give you a massage”. Once they were confident with sharing Story Massage then we began using it whenever was appropriate. They children know they can ask for Story Massage whenever they like or they feel the need for calming down. We also ran Story Massage taster sessions for the whole school to celebrate our Nurture Room’s 10th birthday. Each class had the opportunity to come to the hall for a short time and do some Story Massage. This allowed the staff to see the positive benefits of Story Massage in action! Story Massage combines the benefits of positive touch with the creativity of words – whether as story, rhyme or song. Ten simple massage strokes form the basis of the Story Massage programme. These strokes have a descriptive name, such as The Circle or The Sprinkle, and an easy to recognise symbol making it fully accessible for all ages and abilities.